As the remains of nearly 60 buses smoldered at a depot in Bangalore, the “Silicon Valley” of India, protestors chanted, “We will give blood, but not Cauvery!” Downstream, in neighboring Chennai, at least 100 vehicles have been damaged, more than 500 people have been arrested, and a 25-year old died after setting himself on fire in protest. The spates of violence in the capitals of the parched south Indian states of Karnataka and Tamil Nadu are the result of a sharp dispute over allocation of the 475-mile long Cauvery River. A pre-existing agreement requires Karnataka to ensure a certain allocation of water is released from the Krishna Raja Sagara dam downstream each month. But authorities argue that because more than 40 percent of the state’s water storage tanks are dry, it is unable to do so. Tamil Nadu officials, facing drought in 93 percent of their state’s districts, have taken their case to the Supreme Court. On September 5, the justices ruled Karnataka must provide Tamil Nadu 12,000 cubic feet of water from the Cauvery per second (cusecs) per day until September 20. Karnataka has yet to comply with the order. While India is no stranger to internal water disputes, this outburst is the first time in recent history that one has spilled over into violent conflict in the streets. Regional drought coupled with India’s disjointed system of water governance, which has no clear delineation of roles and responsibilities across the federal and state governments, has fanned the flames. The Cauvery River has been a source of dispute between Tamil Nadu and Karnataka since India was a British colony. After decades with little resolution, the Supreme Court directed the government to establish the Cauvery Water Dispute Tribunal in 1990, an organization led by the prime minister and mandated to adjudicate all disputes related to water sharing. In 2007, the Supreme Court allocated each state along the Cauvery a specific amount of water through the Tribunal. The decision requires Karnataka to release more water during times of stress, but after this year’s particularly poor monsoon, the state is balking. The Supreme Court order on September 5 to release more water sparked protests across both states – in Karnataka, for fear of losing drinking water, and in Tamil Nadu, against anyone from Karnataka. 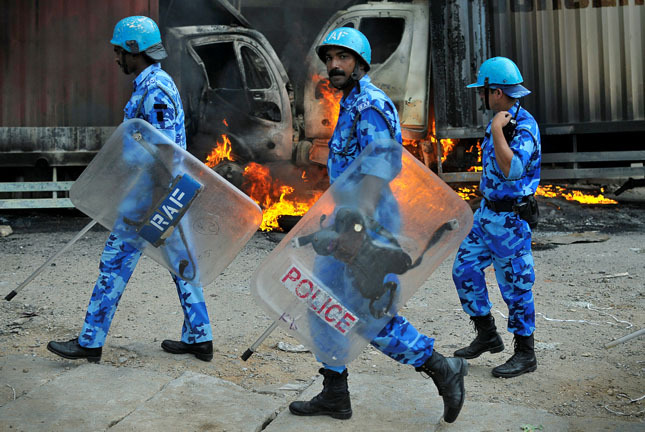 Just days after the decision, riots prompted businesses like Infosys to close up shop, buses and trucks with Tamil Nadu plates were set on fire, and two people were killed in Bangalore. Karnataka imposed a section of the Criminal Procedure Code which prohibits the assembly of more than five people and called up more than 15,000 civil police officers, three border security force platoons, and 30 city-armed reserve platoons to patrol Bangalore. Still, no additional water was released from the Krishna Raja Sagara dam. On September 21 and 30, the Supreme Court issued its third and fourth consecutive orders for Karnataka to release more water. The Karnataka Assembly, faced with growing public instability on the one hand, and a potential for constitutional breakdown on the other, passed a resolution on October 3 to release water for farmers in Tamil Nadu, but the actual amount is not made clear in the legislation. On October 5, the assembly said it was releasing 2,000 cusecs, rather than the 6,000 cusecs a day called for by the court. Tensions over water are elevated across India, now in its second consecutive year of record-breaking drought. An estimated 330 million people – one in four Indians – have been affected this year alone. In the southern state of Andhra Pradesh, temperatures soared past 105 degrees Fahrenheit, and combined with insufficient water the heat has caused more than 700 deaths in just the last four months. In the western state of Maharashtra, an 11-year old girl died of heatstroke after she spent four hours waiting to collect water from a crowded village pump. Although monsoon season has just ended, a number of states have received less rain than usual. Karnataka experienced a 48 percent deficit in rainfall, and Tamil Nadu a 19 percent deficit. Of India’s 1.3 billion residents, 700 million are connected to the agricultural sector in some way, which represents 15 percent of the gross domestic product. According to India’s Central Water Commission, water availability in the nation’s 91 reservoirs is at 29 percent of total storage capacity. With less water available for irrigation, farming families are being forced to leave their land in search of alternative livelihoods in cities like Mumbai. Many from rural villages don’t speak Hindi or Marathi, the primary languages of the metropolises, and without a steady income can be relegated to makeshift shelters in parks and construction sites. Crippled by debt, meager crop yields, higher food prices, and six percent inflation, an increasing number of farmers have taken their own lives. More than 8,000 farmer suicides were reported across the country in 2015, and Karnataka had the highest increase, from 321 in 2014 to more 1,300 in 2015. The stress across the subcontinent is leading to some innovations. In Tamil Nadu, farmers have adopted “precision farming,” a technique where water and water-soluble fertilizer are applied in small amounts, maximizing yields and reducing the amount of groundwater pumped. The practice, piloted in 2007, has resulted in increased average yields and a reduction in water losses. Near the airport in the Maharashtrian city of Pune, a billboard doubles as a rainwater harvesting tank with a 2,000-liter capacity. When a sensor detects the tank is full, a text message is sent to a collection team, which distributes it to nearby villages via trucks. Vodafone, one of India’s largest telecom companies, is footing the bill for every part of the process. While these temporary innovations allow for farmers to preserve their livelihoods, larger changes will be necessary to defuse the transboundary issues evinced in the Karnataka-Tamil Nadu showdown. India’s high courts have made many significant environmental decisions in recent years that have evoked protest from state authorities and constituencies, as documented in the Wilson Center’s short film, Broken Landscape. Responding to complaints about water pollution from unregulated and highly destructive “rat-hole” coal mining in Meghalaya, the National Green Tribunal, a new, specialized judiciary body, announced an unprecedented state-wide ban on coal mining in April 2014 until effective regulations could be agreed on. There have been large protests and it is estimated Meghalaya has lost seven to eight percent of its GDP since the ban, but little progress has been made. Responding to an appeal of the tribunal’s decision, the Supreme Court ruled in September that coal that has already been extracted can be transported to avoid a potential surge in water pollution during the rainy season, but the ban on new extraction remains. The judges also reiterated the tribunal’s order for the state to submit mining guidelines. India faces serious systemic challenges in governing and managing the delivery of its natural resources, especially water. Although India’s constitution calls for water supply to fall under state jurisdiction, the federal government is also mandated to resolve interstate water disputes and plan for water allocation. At the state level there are separate boards that govern drinking water, major and minor irrigation, and hydropower. This degree of fragmentation makes it difficult to impose comprehensive policies that make water governance more efficient. The challenge is acute along the Cauvery, where people in Karnataka and Tamil Nadu have responded with anger. The Supreme Court at first ordered the creation of a new Cauvery Management Board, but then reversed itself only days later. The confusion and stare-down between state governments and the Supreme Court appears set to continue, only recently relenting slightly after some rainfall. Hundreds of Karnatakan farmers have threatened to block major sections of the Mysuru-Bengaluru highway on October 11, potentially disrupting traffic on a widely observed religious holiday. India’s growing water demands and the effects of climate change are strong arguments for a clearer national framework that outlines the roles and responsibilities of the central and state governments. It will take time and political will to restructure such a complex system. In the interim, more immediate relief may be needed to help those individual farmers most affected, including crop loss compensation, alternative livelihood programs, and innovative water management schemes. Sources: Al Jazeera, Atlantic Council, BBC, Catch News, Central Water Commission (India), Circle of Blue, CNN, The Economic Times, Firstpost, Global Forum on Agricultural Research, GlobalPost, The Guardian, The Hans India, The Hindu, The Indian Express, India.com, IndiaToday, Livemint, Ministry of Water Resources, River Development, and Ganga Rejuvenation (India), NDTV, The New Indian Express, The News Minute, Roads and Kingdoms, Suni Systems, The Tribune, Today, United Nations Development Program, The Washington Post, The Wire. Photo Credit: Security forces in Bangalore, Karnataka, September 12, 2016, courtesy of Abhishek Chinnappa.